I was fixing for chocolate cake, but not just any kind of chocolate cake. I needed something that was rich and over the top dense (light and airy cakes have their place, but not this time :P). The contenders were Laura Calder's Craggy Chocolate Cake and Delicious Miss Dahl's Flourless Chocolate Cake. However, in my Laura Calder cookbook I found a recipe for Chocolate Cream Cake. This recipe came from Julia Child (so right then and there we knew this thang was going to be RICH!). The cake was made of all the bad stuff (literally just chocolate, eggs, sugar, cream and some flavourings), but was oh so good! 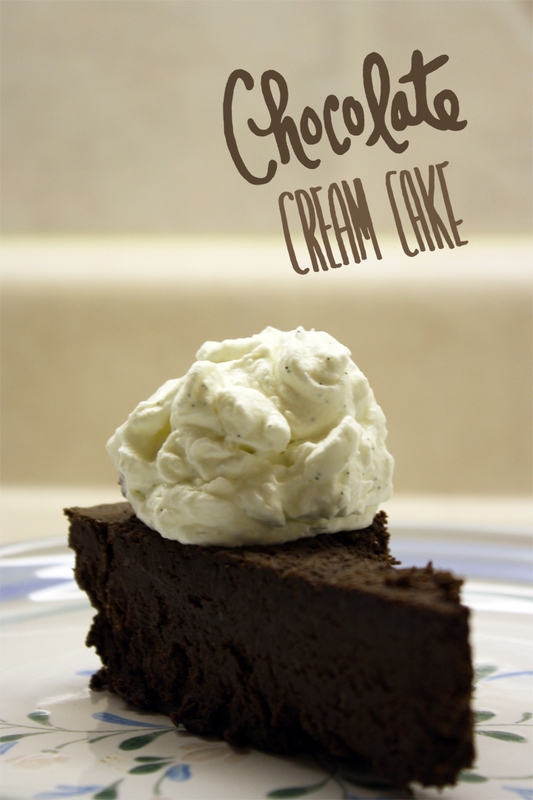 You definitely need the lightness of the whipped cream to balance the dense, chocolatey cake (I gussied it up with vanilla bean). This cake was a force to be reckoned with, a small sliver is all you need- it was like eating a slice of truffle!